Steinway Model M piano cover, measuring 5’7″. The cover is made out of a black padded, quilted material–with the outer layer being made of nylon, in a 4″ diamond pattern. The inner layer is also black in color, and is a soft material to prevent any damage to your piano. Our piano covers feature side splits, which allow you to flip open the front of the piano cover to expose the keyboard, so that you can play the piano without having to take the entire piano cover off. Each split is located above the front leg on each side of the piano. Each cover is in stock, and has been carefully folded and stored in a vacuum-sealed bag, cutting your shipping cost by over 60%. 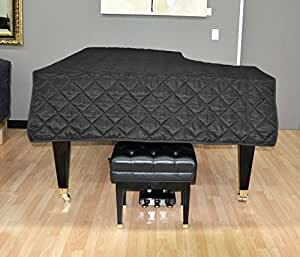 Quilted covers are regarded as the most attractive covers, and this piano cover is great for any home setting, as well as churches, schools, or anywhere you want to protect your piano from dust or physical damage.